Clint Barton’s coming face-to-face with an old friend in West Coast Avengers #2, but judging by the cover art by Stefano Caselli and Nolan Woodward, it doesn’t look like Tigra’s happy to see her former teammate. Plus, what the heck is going on with her oversized stature? Though she’s been a major player here and there throughout her history, Tigra has more often been presented as a supporting character in various Avengers sagas. Most recently, she was a member of the Underground (alongside Clint Barton) in the pages of Secret Empire. As to why she’s about to make her return, WCA writer Kelly Thompson wouldn’t share any details, though she did make it clear Tigra was on her short list of characters to highlight from the start. 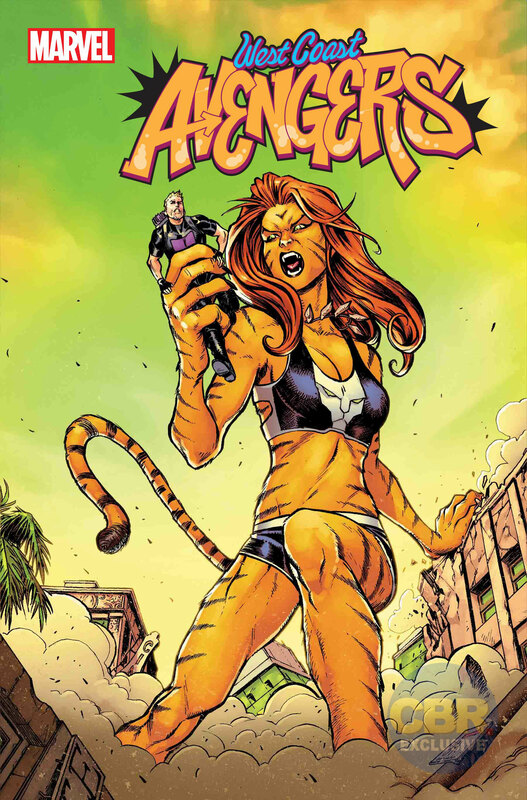 “Tigra is so vital to the original West Coast Avengers, and she’s a character we really wanted to get into the book from the jump, even though she didn’t necessarily make sense as a member on this particular team,” Thompson told CBR of the heroes return. “So when I saw an opportunity to use her in a really unexpected way, I jumped at it. West Coast Avengers #2, by Kelly Thompson and Stefano Caselli, arrives in September from Marvel Comics. The post EXCLUSIVE: A Classic West Coast Avenger Returns in Issue #2 appeared first on CBR.